A one under 70 left the County Down man on five under par 137, just five shots behind halfway leader Raymond Russell of Scotland in a share of seventh. Currently 15th in the Rankings and in position to win one of the 20 European Tour cards on offer through the Challenge Tour, Thornton is targeting the top ten at the end of the season in order to guarantee the best possible category for next year. But the 34-year old is also aware that things can change in an instant and that a bad round in Rome could see him swallowed up by the chasing pack in the Rankings race. “It was a tough day out there – this golf course is very tricky and one bad shot on any of the holes can really stuff your round up,” Thornton said. “I didn’t play great today but I suppose I have to look at the positive side of that and realise that I am still in a very good position despite that. “The Rankings are so tight around where I am at the moment – there is only €13,000 separating the guys from 11th-20th in the Rankings so it is a difficult position to be in. “One minute you are thinking about a good finish and trying to get in a good position so that I can go to the Grand Final and really go for it; and the next minute you are looking behind you thinking that a bad round could put me in that horrible position of trying to defend what I have at the Grand Final. Athlone’s Colm Moriarty is by no means out of the tournament after notching two birdies in his closing three holes for a 70 that took him to one under par at the Olgiata Golf Club. But he will have to produce two low-scoring weekend rounds if he is to achieve his goal of a top three finish in order to qualify for the elite 45-man Challenge Tour Grand Final in three weeks’ time. Ranked 66th in the Challenge Tour money list, Moriarty needs to earn at least €11,000 at this the penultimate event of the season to break into the top 45 who qualify for the season finale. 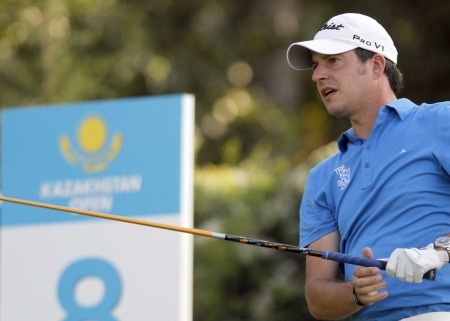 As for Niall Kearney, the Dubliner added a 74 to his opening 80 to miss the cut on 12 over.